← Birmingham Cocktail Culture – It’s a proper thing! 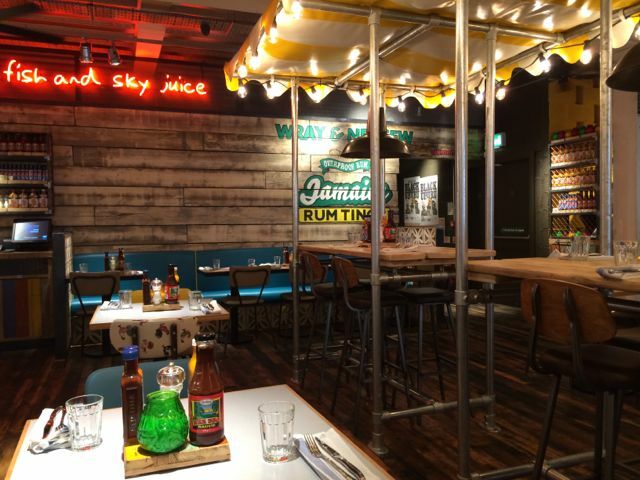 Turtle Bay has brought to Birmingham its Caribbean island vibe with its seventh UK branch which opened last week on John Bright Street. The area is becoming a popular spot for those who fancy an artisan drink and a bite to eat – Turtle Bay, Brew Dog, and Cherry Reds have all opened here in little over a year joining the refurbished Railway pub. The interior has a heavy-handed Caribbean look. 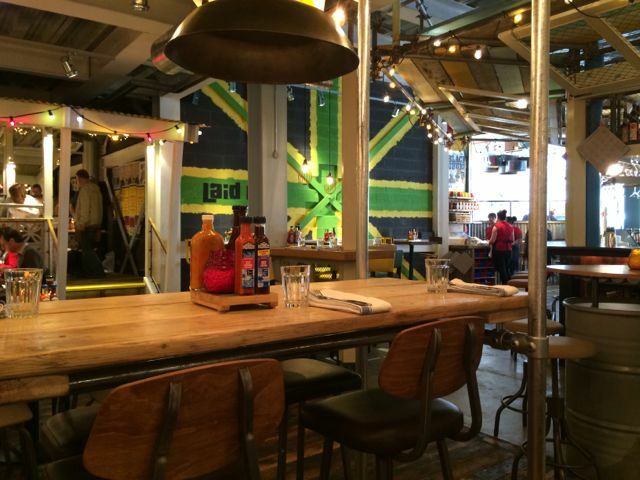 Think Jamaican flag, carnival colouring, drift wood and tin roofs and you won’t be far off. The theme is carried through in the rolling reggae soundtrack, rum and banana based cocktail list, and a menu on which over half of the dishes have jerk spice. Apparently with this theme, more is more! It’s a big restaurant and there’s a lot of seating. The table we had for a bank holiday lunch was in the back and with the rows of tables it was a bit canteen-like for me. The front of the venue is much lighter and the tables looked more inviting, the back is cut off by the shack-like bar. 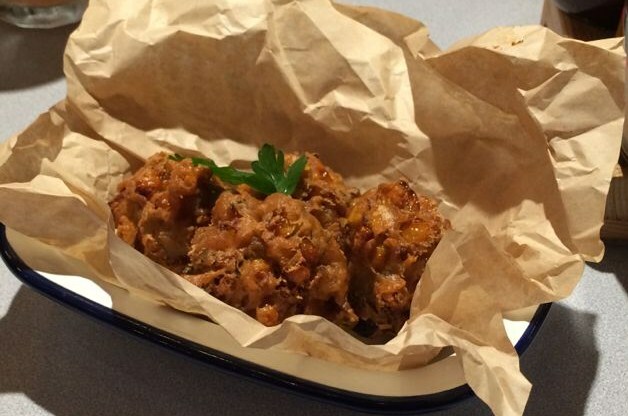 The eatery offers small street food plates (£5) as well as larger lunch (£7) and dinner dishes (£10-£15). There’s a range of cocktails on offer (£7), Red Stripe on tap, and the usual other sundries. 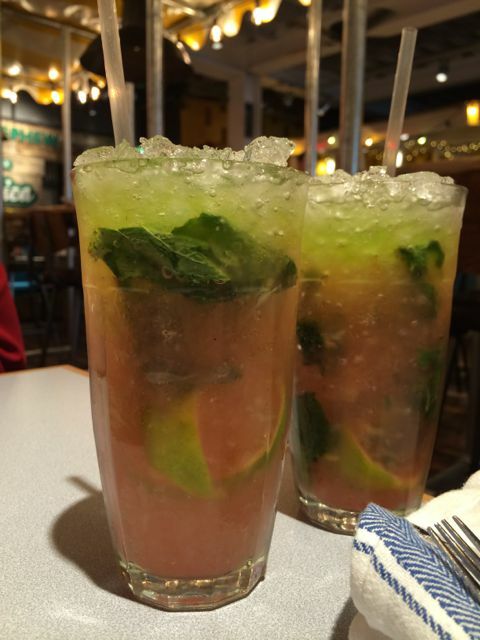 We tried the Marley Mojitos in their daytime 2-4-1 offer – a mix of rum, midori, mint, fresh watermelon and Appleton rum. They were tasty, boozy, and refreshing. We shared a small plate of sweetcorn fritters as a starter. The menu said it came “with hot sauce”, actually it didn’t, the hot sauce is on the table. I would’ve preferred a small dipping pot. The fritters were good and well spiced. 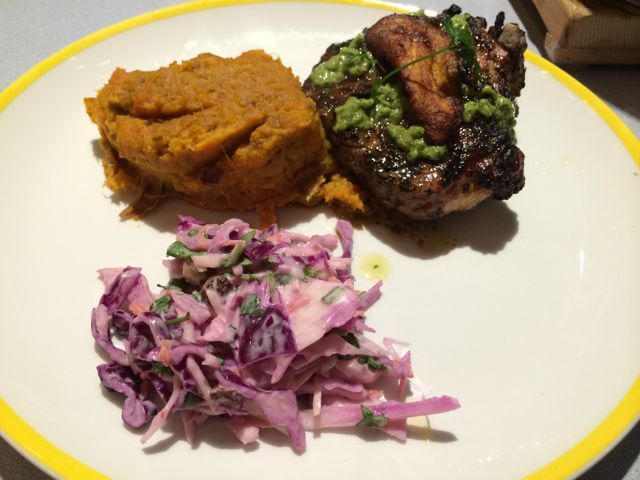 For mains I had the Dipped Pork Steak with the sweet potato mash and Caribbean Slaw. The mash was well seasoned and I enjoyed it, but I don’t know what made the Slaw particularly Caribbean. The pork steak was a bit of a disaster. It looked nicely blackened and barbecued and with my normal gusto I started eating it. I had a couple of slices then realised the inside of it was pinky raw. I brought this up with the waitress who said that’s how chef cooks it – unlikely I thought but I left it at that. A manager who was floor walking spotted my uneaten food and, mortified, apologised and took it off the bill. It was well handled but, let’s be honest, restaurants shouldn’t be serving raw pork. Caribbean thing?) and stuffed with jerk spiced chicken. This was served with spicy paprika fries. A good plate of food. The slaw and Mojito really helped to cool spice-tingling lips. Despite the raw pork fiasco we’ll probably go back. It’s fun and the cocktails and food were tasty. It would be great for a group of friends to go for a rowdy casual evening. This entry was posted in Price: Average, Price: Cheap as Chips - Inexpensive and tagged Birmingham Restaurant, birmingham restaurant review, birmingham review, eating out in birmingham, Out In Birmingham, out in brum, OutInBrum, restaurant review, Where To Go In Birmingham, where to go out in birmingham. Bookmark the permalink.